This is the daily Merry Blogmas 2017 science post for December 18. | Did you even know that clay minerals like kaolin are used as pesticides? It came as a surprise to me, truth be told. I have had held some hefty pesticides and hazardous materials certifications over the years. So how did I ever miss knowing this? Seriously, that sucking noise you hear is my tongue being removed from my cheek. Koalin is a catch-all name for a commodity that includes kaolinite (Al2(Si2O5)(OH)4) and its two isomers, halloysite (Al2(Si2O5)(OH)4), and dickite (Al2(Si2O5)(OH)4). Isomers are compounds that share the same chemical formula but have different internal arrangements of elements. 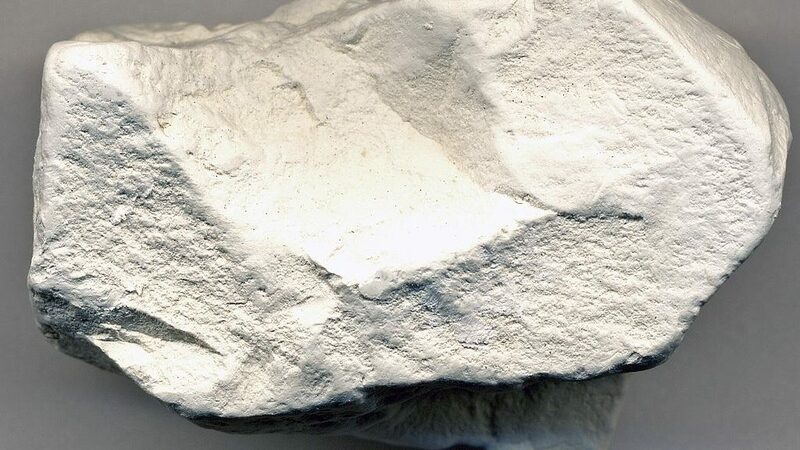 Kaolinite is the main ingredient of kaolin. Other ingredient are presents in trace amounts. Kaolin used to make porcelain. It’s biggest use is for coating paper. Many cosmetics and toothpastes include kaolin. Until the 1980s, kaolin was one of the ingredients of the popular anti-diarrhea medicine, kaopectate. The manufacturer replaced it with another clay, attapulgite. Attapulgite has some improved absorption qualities compared to kaolin. Attapulgite’s main attraction was its lower price. In the 1990s, kaopectate dropped all clay ingredients entirely. Starting in the 1990s, people started to use kaolin as a pesticide for vegetable crops and orchards. To use kaolin as a pesticide, you spray or paint of slurry of it on the plants you want to protect. When the slurry dries, it forms a white-powdery coating. This coating lets the plant breath and still see sunlight. In addition, most insects can’t penetrate the coating to harm the plant. As a pesticide, kaolin has many advantages. The most important is its benign affect on the environment. It’s not toxic if you ingest it, given its historical use as a medicine. Kaolin is not toxic when you smear it on your skin in cosmetics. It’s considered a low-toxicity substance if it gets into water and comes in contact with fish. It does has one big downside and that’s its not-so-benign breathing hazard. Like all silicate minerals, it’s bad to inhale. Its short term effects are lung irritation. Its long-term effects are the nasty mineral-dust illnesses like silicosis. So long as you take care not to breath any of it, though, kaolin is as friendly to the environment as it gets. This following is not a tangent. This information is will be needed in just a few paragraphs. Clean-up measures to follow in the case of an accidental spill. Ignoring what’s on an EPA pesticide label is illegal for any professional in the pest business. PubChem is a public database put together and run by the U. S. National Institute of Health. It is a wonderful thing. You can look up just about any biochemical compound and see all kinds of information assembled in one place. All the information is neatly organized and tagged with convenient citations. Even manufacturers, clinical trials and patent information is listed if relevant. While PubChem info is both helpful and convenient, it has one big downside. It sometimes turns into nonsense because it’s a mishmash of cut-and-paste. Having used PubChem a lot, I think the folks who put these web pages together may lack the ability to make some needed edits. This is typical for PubChem: cut-and-paste with lots of repetition. We get to see just about everyone’s description of kaolin. Note the third entry under color. I’m still trying to figure out why triclinic, which is kaolin’s crystal class, is under color. Wow. A vapor pressure of zero for an inert solid like kaolin. Who would have thought? The best part of the kaolin page from PubChem are the instructions for what to do if there’s an accidental spill of kaolin. This left me wondering who was plagiarizing whom; however, the next section left my jaw hanging. Remember, our topic here is a clay found along river banks that’s so boring it’s been used in medicine. Someone needs to work on their grammar. We’re on a roll here with the of indirect quotes from a kaolin pesticide label. The above paragraph is even funnier when you learn that the PPE (“personal protective equipment”) recommendation here is long pants, long-sleeve shirt, shoes and socks. Add a respirator if there’s any kaolin dust around. Other than the respiratory hazard, kaolin is basically harmless. Well, I suppose you could maybe kill yourself from intestinal blockage by eating several pounds of kaolin. That’s actually happened, no kidding. But seriously, folks, the pesticide label quoted by PubChem is a piece of work. It’s a great example of regulatory idiocy trumping common sense. 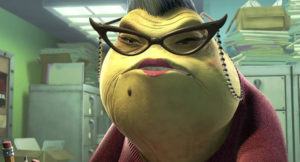 Roz, patron saint of government bureaucracy. Image from the Pixar Wiki (2013) CC-BY-SA.